Whole Naturally Shed Deer Antler Stagler – A Single Deer Antler can be yours. Sold individually. 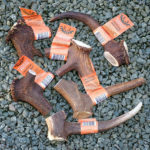 Demand is high, but the quality is guaranteed – premium quality antler which is naturally shed from wild deer annually. Perfect for shop displays, sculptors, artists, designers and film sets. Whole Naturally Shed Deer Antler available. Sold as single antler but if you contact us I will have a good sort to see if I can find an almost matching pair! 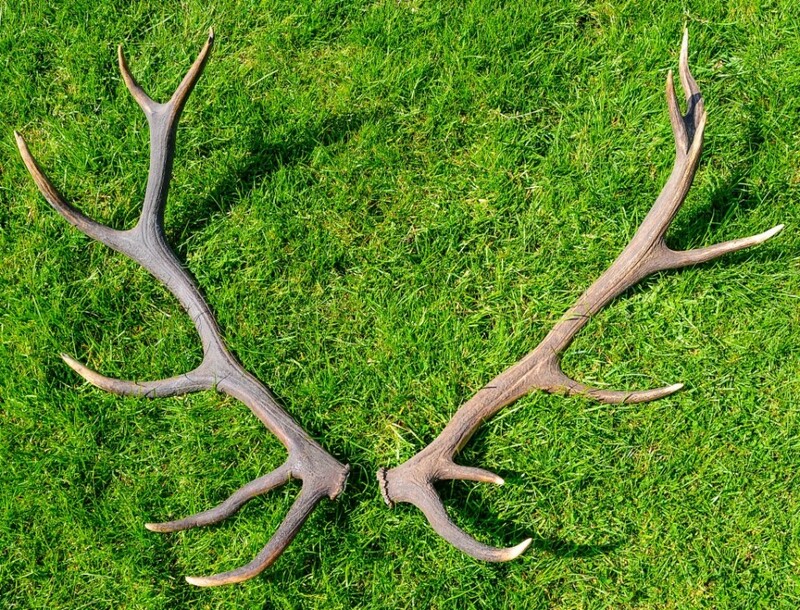 Naturally shed each year we only guarantee ours are premium quality wild Red deer antler. Making them a wonderfully eco-sustainable product. A seriously impressive and quite a thing to behold. One single LARGE antler will typically weigh between 1.5kg and 2kgs with 6 or more points. We constantly get told quite how solid and tactile these are! We have a reputation for going above and beyond. Select 2 in your online order and let me do the work! Popular with Artists, Sculptors, decorators, ideal for photographic shoots, interior design creations, stick making, coat and hat racks, light fittings, pen making, handicrafts or just a conversation piece. Artists and Sculptors love us. 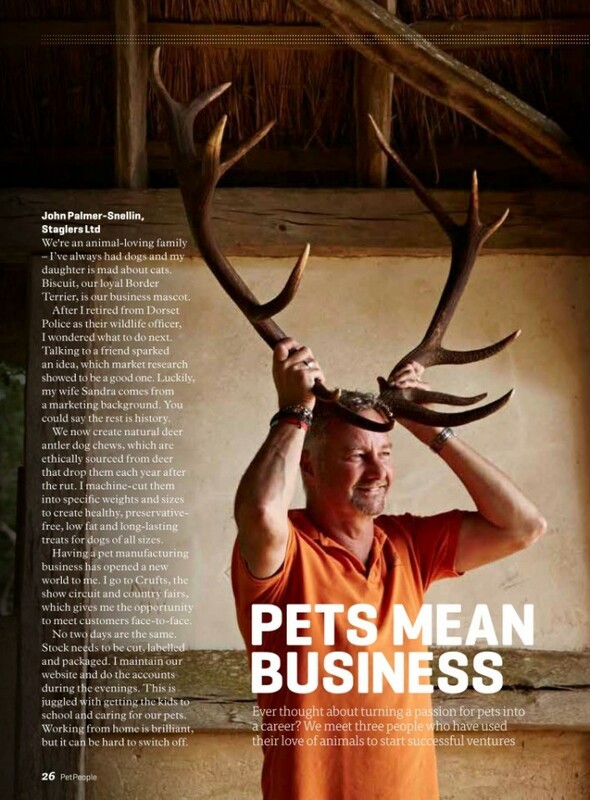 We have supplied some magnificent antlers to a local sculptor in Hampshire (Nadine Collinson)and are in awe of the magnificent deer head she created. Amazingly, antler tissue growth is one of the fastest known types in mammals. Antlers are often called “horns” by some, this is due to their look rather than how they are made. Antlers are true bone and are composed primarily of calcium and phosphorus. They are deciduous (dropped or shed each spring and grown anew each and every year). Located on the frontal bone of the skull is the pedicels. First of all, from a couple of months of age, male fawns (a button buck) show the base from which the antler will grow. At six months old you will see small, hair covered bumps, on his head. Secondly, Deer grow their first set of antlers when they are approximately one year of age. In Spring, as the daylight lengthens they begin to grow. They grow as much as a ¼ inch per day! Within month 1 the first tine or brow tine will have begun to form or split off. By month 2, the second tine/point will have begun to form. 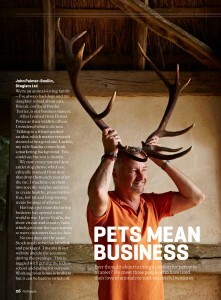 Especially relevant is that in just 4 months, the antlers are fully developed. 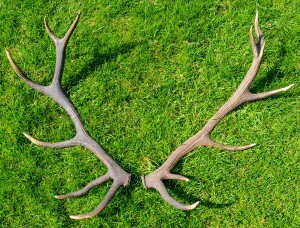 During the early summer, deer antlers are soft to the touch or spongy. Towards the middle of summer, as the form is being finished, the deer begins to develop the bone.By late summer antlers begins to harden. Finally the blood vessels within the antler itself are filled and lose their ability to nourish the velvet, and it dries up and falls off. Hard antlers remain on the deer through the peak of breeding but drop off after the rut in the Autumn. Some antlers fall off at exactly the same time, more often one at a time or one antler may be held for weeks or months after the first antler is shed. The older bucks typically shed their antlers earlier than young small bucks, often a result of the large amount of energy they expend during the rut. Similarly, deer in good condition typically hold their antlers longer than deer in poor condition. Deer antler size is determined by three factors: age, nutrition, and genetics. Age is the simplest factor and also easy to manage. Simply put, as a buck gets older, his set of antlers get bigger. At 3 and a half and older, he will average 8 points. What a truly magnificent pair of whole deer antler these majestic animals grow.